Anna’s Griffin Doseck drives past Marion Local’s Nathan Bruns during a nonconference game on Jan. 5 in Anna. The Rockets are ranked No. 6 in Division III in this week’s state Associated Press poll. Anna dropped in Division III and Sidney received votes in Division I in this week’s state Associated Press boys basketball polls. 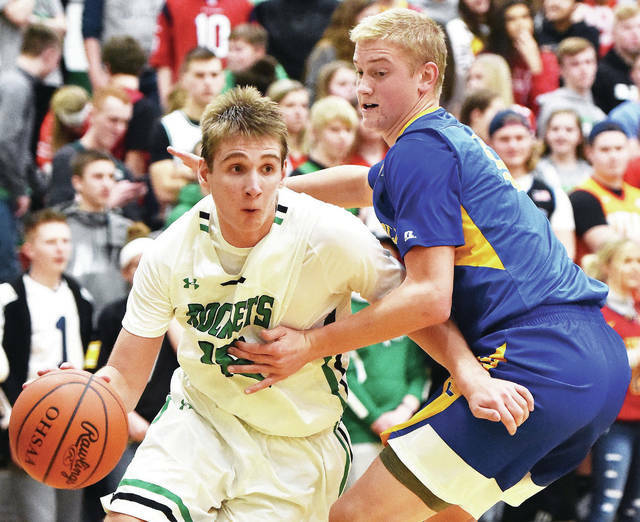 The Rockets (16-1) lost their first game of the year on Friday against Jackson Center and bounced back with a win at Versailles on Saturday. They dropped from third in Div. III to sixth. The Yellow Jackets (16-3) won four games in six days before the poll was released on Monday. They’ve peaked at No. 10 this season. Fellow GWOC American North squad Vandalia-Butler (16-2) is ranked ninth this week. It’s the first time the Aviators, which lost in overtime to Sidney in December, have been ranked this season. Others receiving 12 or more points: 11. Logan 26. 12. Sidney 21. 13. Youngs. Boardman (1) 18. 14. Mentor 13. Others receiving 12 or more points: 11. New Philadelphia 31. 12. Cin. Aiken 26. Others receiving 12 or more points: 11. Xenia Legacy Christian Academy 18. 11. Richmond Hts. (1) 18. 13. Cincinnati Christian 12.